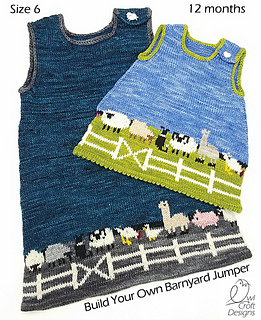 Adorable barnyard animals along with a watchful sheepdog adorn this endlessly customizable A-line jumper. 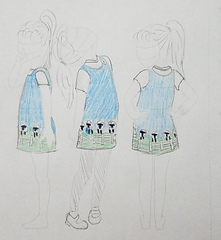 This clever design can be worn as a dress by a toddler, as a tunic by a young child, and as a top by a grade schooler. Wide arm openings allow for this growth: wear it over a turtleneck in the winter and a tee shirt in the summer. Go with natural colors or go wild and whimsical. 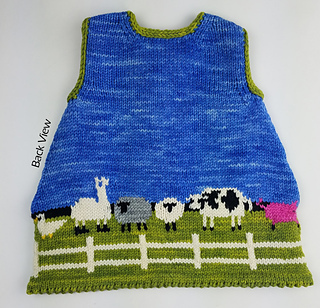 Loads of choices means you can make this over and over again, each jumper will be unique! Dragonfly Fibers Valkyrie worsted, 100% 4-ply super wash Merino, 200yds/182m (4oz/113g) per skein. • For the lining: A narrow band of lining will cover and protect the floats, allowing for longer floats without having to tack them down frequently. Use an old T-Shirt of any color. A sewing needle and thread are also needed. This extra effort will help create a garment that lasts. 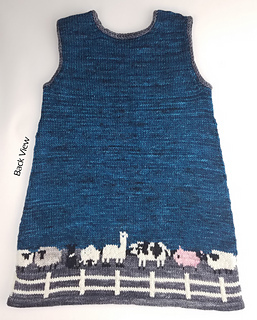 • For planning the animals: copies of the DESIGN BLOCKS section of this pattern, scissors, clear tape, plain paper, and colored pencils/crayons in the colors you wish to knit. 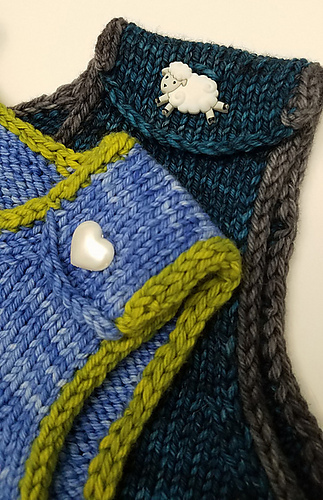 Provisional cast on, knitting in the round, two-color stranded color work, intarsia, reading a color work chart, increasing, decreasing, short rows, I-Cord. 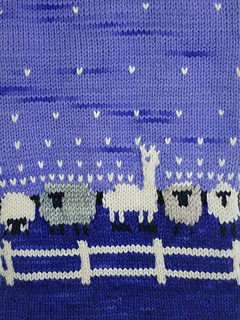 • If animals are of different colors, utilize Intarsia in the Round (see above “Skills Used”).